Just got back from a fitting at True Spec in San Diego. I'm making this post almost as notes for myself so there are certain things I don't forget. I'll add the TM data after Steve sends it to me. Current clubs are J40 X100TI - cycled around 323cpm so they might be soft stepped? - 37.75" 6i. 1deg upright. D0 w/midsize grip. Spin was in the mid 5500s. Z785 - weird transition from topline to hosel. Felt like there was more offset than there really was. I think my brain over-corrected and I never hit this very well. Feel was soft - didn't have pop that the J40 has. 919T - don't remember anything standing out or anything being bad about it. Miuras - lumping both together because I didn't find there to be a big different between the two clubheads. Incredibly consistent across the face. Didn't matter where you hit it - the ball always went ~185 yds. AP 19 - Long. Like really long. More forgiving on thin hits (my typical hit). I can dial back to 80% swing and still hit it 185. Full swing puts it closer to 200+. Great feel - very snappy forged "smack" on contact. All 5 club heads brought the spin rates up to high 6s and into the 7s. Settled on the X100TI again but I also hit the $ Taper 130. Felt very similar to the X100TI but launched 0.5-1deg higher. I could play either shaft. I will likely end up buying a set of Apex Pros but I'm not going to pay for the build through TrueSpec. Quoted price was around $1,900. The best part about the entire experience was validating shaft/swing weight, and finding the right types of head for me. BST lookout! Congrats! Now all of these are forged heads....have you any experience with iblade/S55 as a comparison? 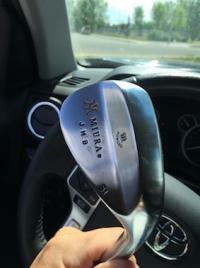 The only experience I have with cast heads are my recent rental clubs when on vacation: M2, Steelhead. Both where terrible feeling on mishits but "acceptable" when struck correctly. Both pretty forgiving and I didn't really notice/mind the offset, width, or topline. He didn't pull any Pings during the fitting unfortunately. Thank you.....apex pros are very high on my list...this ain't helping my wallet! I've had the MC 501s for a few months, and I'm on the fence with them. I've hit a few shots that felt unreal, but most were meh (I know it's the strike). Distance on mishits was a bit more penal than I thought, but the distances are very dependable. Looks wise, may be the best iron I've seen. Thinking of going to i210 but I need to give them a solid chance. Notes- on your phone, works too. 37.75" 6i. 1deg upright. D0 w/midsize grip. Spin was in the mid 5500s. I’m not familiar with the place that you went to for the fitting but if you can afford it I highly suggest you pay the money. What you will get from them vs a box store is night and day. Not only will they check the lofts, they will probably double check the head weights and add lead tape if need be. Also the shafts will be frequencied and likely splined as well. I had this done with my Miuras but with Miuras the heads are spot on in weight and the heads were as well so it was just money well spent for the shafts to be done. I could afford it but the value just isn’t there. I bought a set here for under $900, they’ve never been hit, had them bent, bought my own scale, regripped, etc. for less than what they would have been brand new from Callaway.